I’ve got a busy rest-of-the-week this week, so today’s post is going to be short and sweet. I’m leaving tomorrow to meet with the folks at Thomas Nelson and I’m taking part in an exciting event with Martha White and White Lily. They’ve invited 10 bloggers from around the country to participate in their first ever Southern Baking Retreat – and I’m one of them. I’m SO looking forward to meeting some of my favorite fellow bloggers in person and seeing all that the folks from White Lily And Martha White have in store for us. Be sure to follow me on Facebook and Instagram and I’ll keep y’all updated from the retreat. Y’all, these chicken tenders are awesome. In fact, I think Jack referred to them as “jumpin.” (Isn’t he hilarious!?!?) They are the perfect blend of sweet and salty and since they’re baked and not fried, it’s okay to indulge a little. I hope y’all enjoy them as much as we do! Preheat the oven to 425° F. Lightly spray a baking sheet with non-stick cooking spray. In a medium bowl, combine the coconut, panko, flour, garlic powder, ginger, salt, and black pepper and mix well. In a small bowl, beat the two eggs with the water and 1 tablespoon Dijon mustard. Bake for 15 to 17 minutes or until the juices run clear. 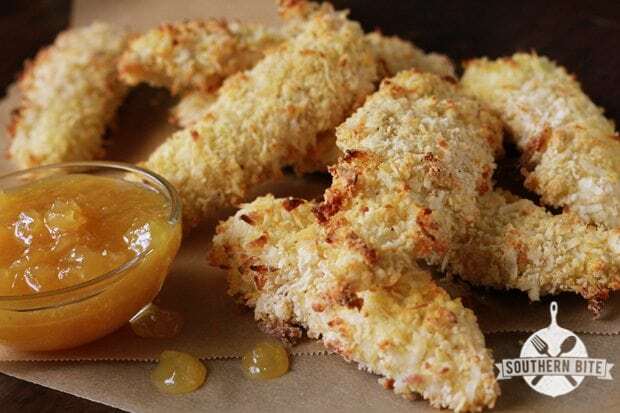 Combine the pineapple preserves, white vinegar, and 2 teaspoons Dijon mustard; mix well. Looks delicious! Enjoy your retreat and keep us posted. Thanks, Margy! I’m working on a recap post now! You bet! I’m working on it now. It was INCREDIBLE! Another one of your delicious, and wonderful recipes that I can’t wait to try! Keep them coming…. Thanks so much, Rosemary! I hope you enjoy! Hi, which is it for the Dijon mustard? 2 teaspoons or 2 Tablespoons? The ingredients say teaspoon but the instructions say tablespoons. I want to try this soon, it looks and sounds fantastic but I want the sauce to be right. Sorry about that. It should be teaspoons. I hope you enjoy it! 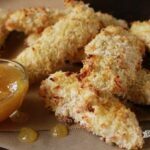 I made these Chicken Fingers this weekend. Really easy with a fun, but not overpowering, tweak to the flavor. My 3 year old lives on chicken strips, so it was fun to mix up the recipe a bit. I didn’t make the Pineapple Sauce, so we dipped ours in spicy brown mustard, ketchup and/or bbq sauce. I recommend this recipe if you have a house that isn’t up for really exotic flavors – it’s subtle but a nice accent to your everyday chicken recipe. So glad y’all enjoyed them! These are so tasty! I hope you will enjoy them! Stacey, I’m interested in knowing if the dip in this coconut chicken recipe is similar to the sweet and sour dip that Captain D’s restaurant has used for years. I’ve tried duplicating it with no luck. Love your recipes! Thanks for your help! Hi Karen! I’m not sure I’ve tried that dip, but will certainly look for it next time I go!